An expansion for Subnautica, in which we explore the ice-bound areas of the planet 4546B. As we play, we explore the game world and reveal its secrets. This is Subnautica expansion pack. Below Zero is an expansion to Subnautica, an adventure action game with survival elements. The add-on was developed by the authors of the original, Unknown Worlds Entertainment studio. 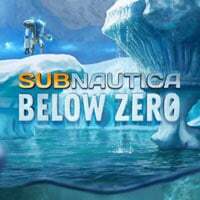 The action of Subnautica: Below Zero takes place after the events presented in the original. Players return to the almost entirely ocean-covered planet 4546B, discovering the secrets of the globe and at the same time fighting for survival. Subnautica: Below Zero takes us to frozen territories, where we can loot both underwater and surface locations. During the game, we have to take care of the basic needs of our hero, but we also have to search for raw materials which would allow us to build useful tools, vehicles, and bases. The expansion introduces the need to take care of the protagonist's body temperature and the possibility of constructing a hovercraft or a small mech, allowing for the exploration of frozen surfaces. Subnautica: Below Zero is a stand-alone expansion, so it does not require the basic version of the game to work. Just like the original, the expansion features voiced dialogue lines - but this time there are more of them, which encourages players to learn the game's story.